Although the default Microsoft Exchange spam filter has a number of features to help block spam and protect businesses from email-borne threats such as phishing, malware and ransomware, few people speak highly of the built-in anti spam for Exchange. One of the most common criticisms is that the default Exchange anti spam mechanisms are not as effective at detecting spam as third party solutions. One of the reasons for this is the way in which some third party solutions approach spam detection – using Greylisting to prevent spam from previously unknown sources, and SUBRL filters to detect malicious URLs within the content of emails. Other features that could increase Exchange email security are also absent from the default Microsoft Exchange spam filter, or have to be paid for separately. Greylisting and SUBRL filtering could significantly enhance Exchange email security – if they were present. On third party solutions, these two mechanisms work independently of Microsoft´s real-time block lists to increase spam detection rates and prevent phishing emails reaching their intended recipients. Greylisting in particular can increase spam detection rates from the 99% achieved by the default Microsoft Exchange spam filter to 99.97% with no false positives. Greylisting is an optional spam control with SpamTitan. While it is highly recommended to have greylisting enabled, messages may be delayed for a few minutes. When used in combination with whitelisting for trusted senders, important emails will not be delayed. SUBRL filtering works in a similar way to real-time block lists; but rather than compare the IP addresses of inbound emails against a list of known sources of spam, the filter compares links in emails against a list of URLs known to be malicious. This feature prevents users clicking on a link they believe to be safe and visiting a website that has been created to obtain login credentials or personal information about an employee that can be used in a spear phishing attack or Business Email Compromise attack. One of the “absent/paid for” features is antispam Exchange outbound scanning. Outbound scanning is particularly important for Office 365 users following the introduction of “IP reputation” marking system, as any business considered to be sending spam or malware could find its IP address on Microsoft´s real-time block list. This would not only affect business-critical communication channels, but could potentially result in the business´s website being blacklisted. Antispam Exchange outbound filtering monitors outbound emails for any signs of spam. Content considered to be spam could be inadvertently inserted by a careless employee or an indication an email account has been compromised as the result of phishing. Basically, antispam Exchange outbound filtering is an important network security issue, but Office 365 users only get access to this feature if they pay for it via an Exchange Online protection package. Another common criticism of the Microsoft Exchange spam filter is that it is too complicated. Naturally, the aim of anti spam for Exchange is spam detection and reporting. However, due to the complicated nature of anti spam for Exchange, Spam Confidence Levels can be set too low with the consequence that the filter is ineffective at preventing spam. Alternatively the Levels can be set too high – resulting in genuine emails being quarantined for having marginally spammy content. Once you combine anti spam for Exchange with Office 365 and Exchange Online protection (or Forefront Protection for Exchange 2010), the complicated nature of anti spam for Exchange multiplies. Furthermore, businesses that want to use the Directory Synchronization feature to help better manage their email accounts have to subscribe to an Exchange Online Protection package. It is no wonder third party mail filtering solutions are a popular alternative to the default Microsoft Exchange spam filter. SpamTitan´s spam filter for Exchange uses many of the features that are absent from the Microsoft Exchange spam filter or that have to be paid for in order to achieve a verifiable spam detection rate of 99.97%. One of the reasons why SpamTitan frequently reaches such high spam detection rates is because our spam filter for Exchange has been designed for ease of use and (free) synchronization with directory tools such as Active Directory. SpamTitan enhances Exchange email security with Greylisting and SUBRL filtering, uses antispam Exchange outbound filtering to identify compromised email accounts, and has automatic updating to ensure the spam detection mechanisms and antivirus software is always current. System administrators will find SpamTitan offers flexible user policy application and multiple web authentication settings, plus our spam filter for Exchange is universally compatible and infinitely scalable. Microsoft Exchange and Office 365 incorporate some security features to provide a basic level of spam protection; however organizations will no doubt discover that a significant number of spam messages and email threats still reach the mailboxes of their employees. Even if security awareness training is provided to employees, there will always be some employees that open malicious email attachments or click hyperlinks to phishing websites. Organizations therefore need to ensure that advanced spam filtering solutions are used to block these email threats and ensure they are not delivered to inboxes. Exchange Online Protection and Office 365 security controls alone will not provide the level of protection that most organizations need. 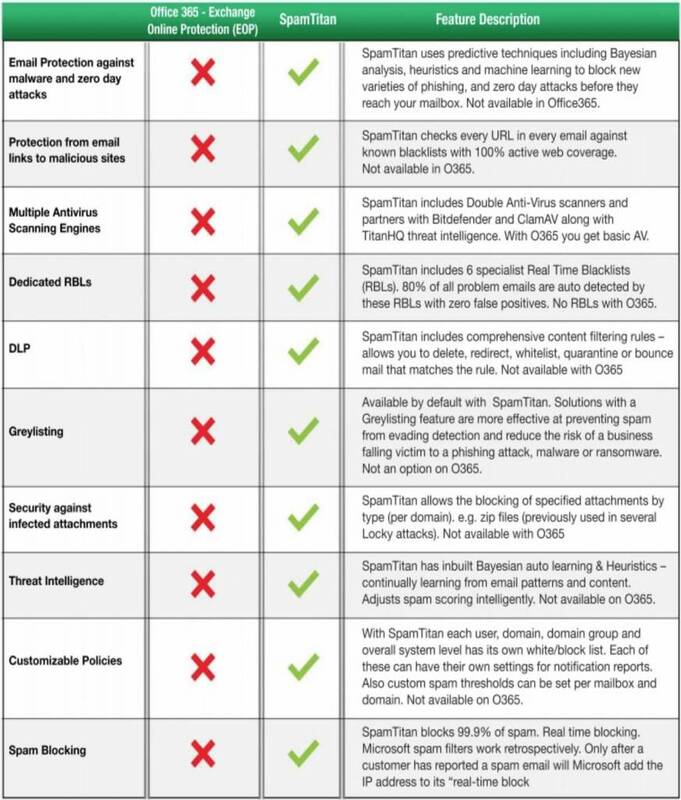 Listed below is a summary of the features of SpamTitan that are lacking in Office 365 and Exchange Online Protection. If you have found little about the Microsoft Exchange spam filter to speak highly of, and would like to try our Exchange anti spam solution for free, do not hesitate to get in touch. Our Sales Technicians will be happy to answer any questions you have about SpamTitan and its suitability as an Exchange anti spam solution, and – once having discussed your current online security precautions – will guide you through the registration process to start your free trial with the most suitable deployment option. The free trial of our Exchange anti spam solution gives you the opportunity to evaluate SpamTitan in your own environment with the volume of email traffic you are accustomed to. The trial also gives you the opportunity to experiment with different features until you find the optimum Spam Confidence Levels for your specific needs so that, should you decide to continue using our service at the end of the trial, no further configuration of our Exchange anti spam solution will be necessary. SpamTitan has a higher spam capture rate than the Microsoft Exchange spam filter. SpamTitan´s Greylisting feature overcomes issues with Microsoft´s “IP throttling” feature. SpamTitan is more likely to prevent the delivery of a spear phishing email or BEC attempt. SpamTitan offers outbound mail filtering as a free feature rather than as a premium service. 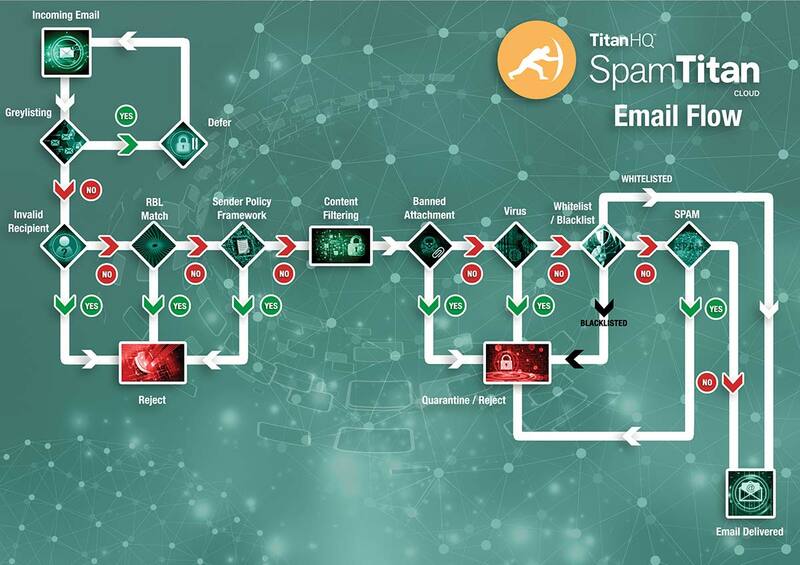 SpamTitan is much simpler to use than the Microsoft Exchange spam filter – reducing the risk of human error. You can try our SpamTitan Exchange Anti Spam Solution for free. Contact us today to find out more.